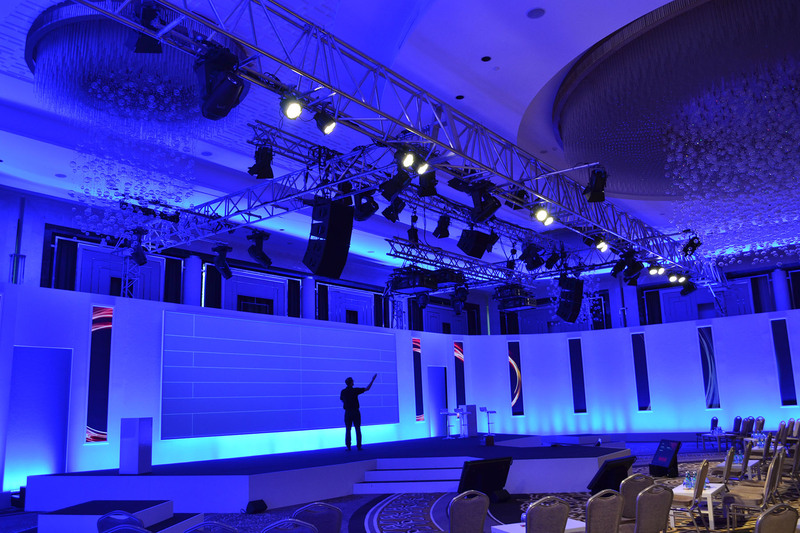 dbnAudile were presented with another brain-teasing rigging challenge by production company WRG for a large corporate event staged in the Crystal Ballroom at the Hilton Istanbul Bomonti Hotel & Conference Centre in Istanbul. 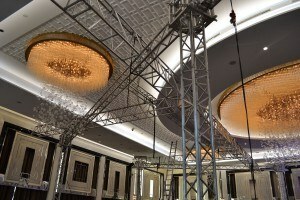 Further to these challenges, another conference was taking place in part of the room during the daytime of the build period, which severely restricted the available rigging installation time and space for the dbnAudile team led by Nick Todd! Normally this alone would be enough to contend with… but there was more! dbnAudile also supplied the event’s lighting which included substantial quantities of Chroma-Q ColorForce 12, 48 and 72 LED battens and ADB F101 fresnels, together with Clay Paky Alpha Spot and Alpha Wash moving lights complete with a Jands Vista console for control. Nick and six other dbnAudile crew were in Istanbul for nine days – with the majority of the work completed in a series of intense spurts of activity.